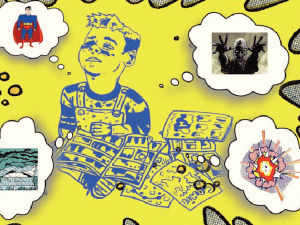 Retro versus hip, conservative versus progressive, traditional versus contemporary—these dichotomies exist in various facets of society at large today. But here in New Orleans, the coexistence of heritage and innovation is one of the city’s most endearing and indispensible qualities. 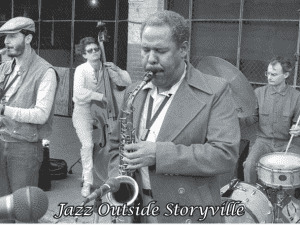 As tightly as we grasp onto traditions like Carnival, second lines and red beans on Mondays, New Orleanians also welcome the fresh, forward-thinking and even downright odd perspectives and customs of our musical, artistic and culinary artisans. Three of these age-old traditions have been appropriated by members of the New Orleans Arts District and the Contemporary Arts Center (CAC) for their annual mega-art-walk and block party, Whitney White Linen Night, taking place this year on August 6. First, New Orleans’ summers are notorious for sweltering heat and thus the most popular vacation season of the South—as well as the slowest season for our tourism and service industries. Second, the first Saturday of every month is traditionally host to gallery-hopping evenings in the New Orleans Arts District. And finally, white linen attire has been a centuries-old favorite in the summer months, as both the reflective properties of the color and the lightness and airiness of the fabric lend especially themselves to outdoor carousing in the blistering heat. 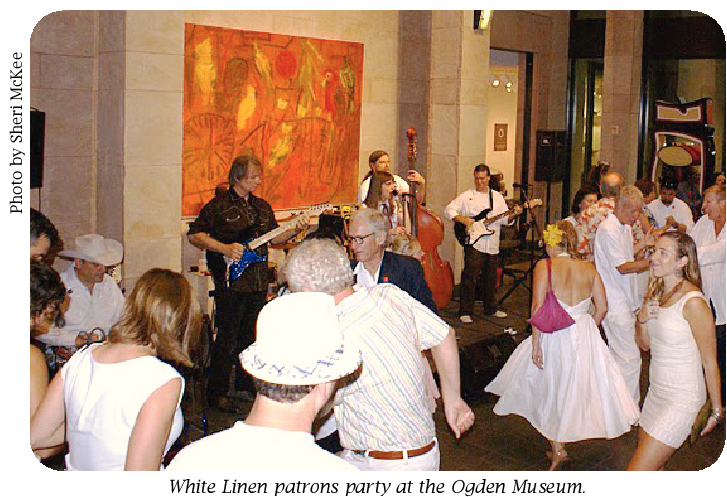 With these in mind, gallery owners of the Arts District organized the first White Linen Night in the mid-90s. In summation, “It was an arts and culture event created to drum up a reason for people regionally to hit the streets of New Orleans in the hottest time of year,” says Lindsay Ross, Director of Communications for the CAC. Each year on the first Saturday of August, galleries along Julia Street open their doors and special collections to art—and wine—enthusiasts who, in true New Orleans fashion, never miss an opportunity to dress up. Ladies adorn an assortment of white dresses and ensembles—from flirty and frilly with white gogo boots, to fancy and formal with white brim hats fit for an Easter Sunday church social— while men sport crisp suits of white linen and seersucker so bright and pristine, they mock the sentiment, “He sure cleans up good!” Now in its 17th year, Whitney White Linen Night has evolved into more of a block party than just a massive gallery stroll. Thanks to official sponsorship by Whitney Bank to help cover initial staffing and production costs, White Linen Night has expanded in both size and scope, eclipsing its predecessor, the CAC’s Art for Art’s Sake, in participants and attendees. This year, the event has expanded its offerings in the three essential elements of any New Orleans gathering: food, booze and music. Between the 300 and 700 blocks of Julia Street each block will have cash bars, ticket vendors and a selection of more than 20 participating restaurants—the most this event has ever had. The event will also feature a new signature summer cocktail, Rain Ginger Mint Lemonade, which will be available in addition to other beverages at the main bars on each block. In between, mini bars will offer a more limited selection of beer, wine and water to keep lines short and moving. Another amenity to keep people moving in the streets, three stages set up at either end and in the center of the block party will host Alex McMurray’s Old-Timey Revue, Ingrid Lucia and the National WWII Museum’s Victory Belles. They will each play three sets with staggered set breaks to keep the live music playing all evening. Besides a photo booth and interactive Facebook page, which launches in July, another crucial component to this summer soiree has benefited from a facelift this year—the paper fans. This year, the CAC has not only tripled the amount of fans printed, but they’ve also transformed its two sides into your evening’s program. In addition to listing every participating gallery, the fan also details the galleries’ featured shows, participating restaurant and drink vendors and the music schedule— serving as more of a guide to the whole event than years past. But amidst these upgrades and expansions, the primary and traditional focus of the evening remains at its core: an outward display of appreciation for our artists, galleries and gallery owners, and of their appreciation for our patronage and support. For more information, visit the CAC’s web site (www.cacno.org), or pass by their media tent in the heart of the block party at Julia and Camp.